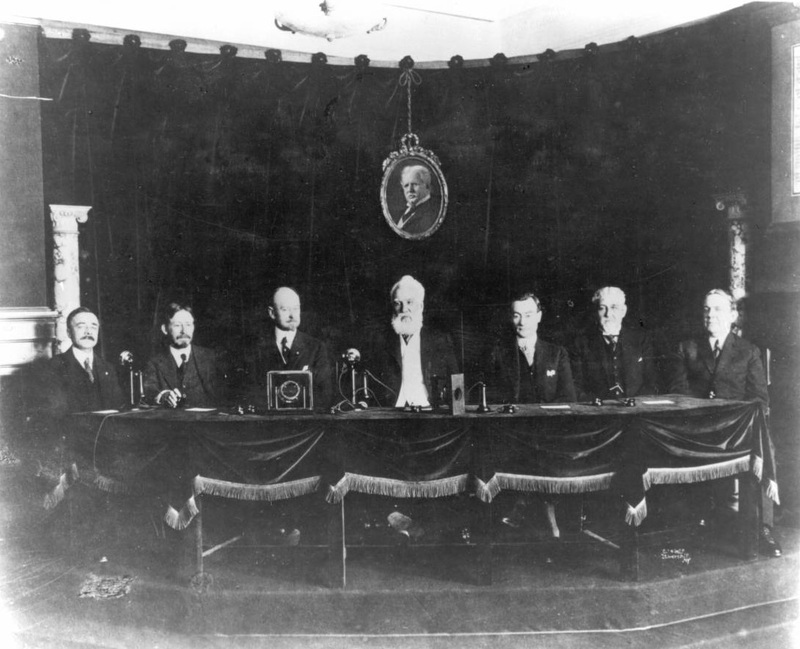 In this photo are (from left): John J. Carty, chief engineer of AT&T, George McAney, president of the New York Board of Aldermen, Union N. Bethell, senior vice president of AT&T, Alexander Graham Bell, Mayor John Purroy Mitchel, C. E. Yost, president of the Nebraska Telephone Company and dean of Bell System presidents, and Comptroller William A. Prendergast of New York. Above Bell is a photograph of Theodore N. Vail, president of AT&T, who participated in the ceremony from Jekyll Island, Georgia, where he was recuperating from a fall. “Telephone Lines P.3; 18107,” Digital Public Library of America, https://dp.la/item/bcb3565672507fab22e92ccfcac6dfb0. Courtesy of Utah State Historical Society via Mountain West Digital Library.